The Rolex Submariner is one of the most popular watches available, and it’s popularity spans the last six decades. Throughout the years, the Rolex Submariner has been updated to modernize its design; however, it continues to maintain its signature Submariner appearance. This popular watch has an extensive history, and we’re here to give you a little bit of background. So let’s jump on in and start at the beginning! The Submarine was created with the sole intent of being a diver’s watch. After extensive testing and development, Rolex was ready to publicly test their watch in September 1953. The Swiss scientist, Auguste Piccard, descended over 3,000 meters into the ocean in the Bathyscaphe FNRS-2 vessel. A Rolex, specially designed for the dive, was fastened to the outside of the vessel. When it emerged, the watch was still ticking away, and the case successfully kept the salty ocean water from leaking in. This dive stirred public’s interest, so when Rolex introduced the Submariner at the 1954 Basel Fair, it was an immediate fan-favorite. The first Rolex Submariner was reference number 6204 and it was water-resistant up to 100 meters. After the first wave of popularity, the brand released two new versions of the Rolex Submariner in 1955. Reference 6205 was very similar to its predecessor, but reference 6200 was rather different with a thicker case, a new case shape, the A296 caliber, and an increased water resistance. In 1959, Rolex released the Submariner reference 5512. The case was enlarged from 36mm to 40mm and the hour hand was updated with their signature “Mercedes” hour hand. This was also the first Submariner to be a certified chronometer and to also include protective crown guards. Today, you can still find the protective crown guards on new Submariners. In the 1960s, divers experienced a problem with their Rolex Submariners. Divers were beginning to dive deeper than before in decompression chambers. In these chambers, the divers breathed a combination of helium and oxygen gases. Unfortunately, the helium penetrated the watch case. As the pressure in the chamber decreased, the watch attempted to release the helium gases. But, the gases could not escape fast enough, so the watch crystal popped off from the pressure. To fix this problem, Rolex designed and patented the first helium release valve. At first, they began to produced Submariners with the helium release valve. Then in 1966, they created a new line of Sea-Dwellers. Today, the Sea-Dwellers feature the helium release valve while the Submariners do not. In the late 1960s, Rolex introduced the first Submariner Date (reference 1680). The Submariner Date remains, to this day, even more popular than the traditional Submariner. This version was also the first to be available in gold. 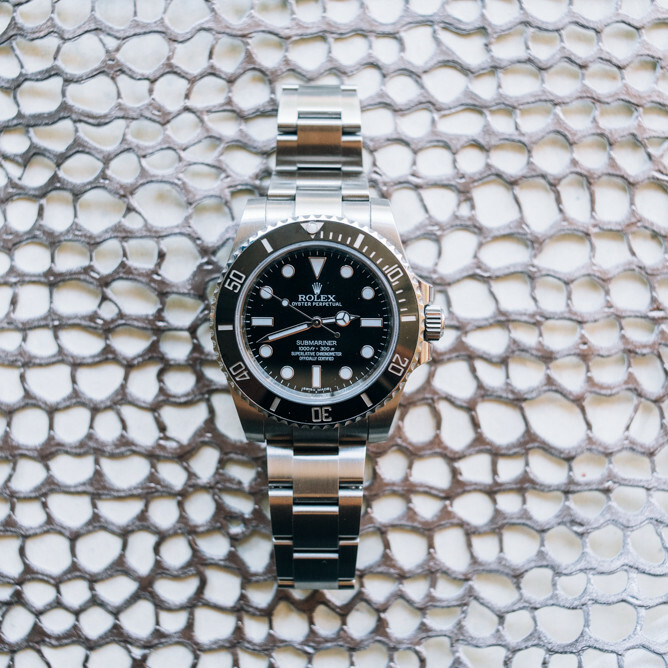 Many collectors view reference 1680 as being the first high-end Submariner. The original Rolex Submariner may be over 60 years old, but age hasn’t diminished the popularity of this watch. Rolex Submariners, both new and vintage, remain some of the most popular luxury watches. Today, the new models maintain the original model's overall appearance as well as its diver-friendly complications. However, there have been some note-worthy improvements to the watch. The watch has an improved water resistance with a more robust case, a Triplock crown, and a thicker sapphire crystal. Compared to the original 1953 Submariner that was water resistant only up to 10 bars (100 meters), the modern Submariner is now water resistant up to 30 bars (300 meters). Overall, the modern Submariners are more luxurious rather than being utilitarian. Although it remains a dive watch, many consumers, who have never dove in their life, purchase the sports watch because of its attractive appearance and high-end finishings. The bezel now has a black ceramic insert that is scratch- and fade-resistant. The dial has also been improved with Chromalight-filled indices. If you’re wondering what Chromalight is, it’s a luminescent material that glows blue in the dark. This is a handy tool whether you’re trying to read the time in the depths of the ocean or in a darkened movie theatre. But perhaps the largest update occurred with the movement. Throughout the years, Rolex has updated and refined the Submariner caliber. Today, the Rolex Submariner uses the Caliber 3135 which is more accurate over a longer period, as well as including an antimagnetic balance spring and a quick-date that can be set instantaneously.